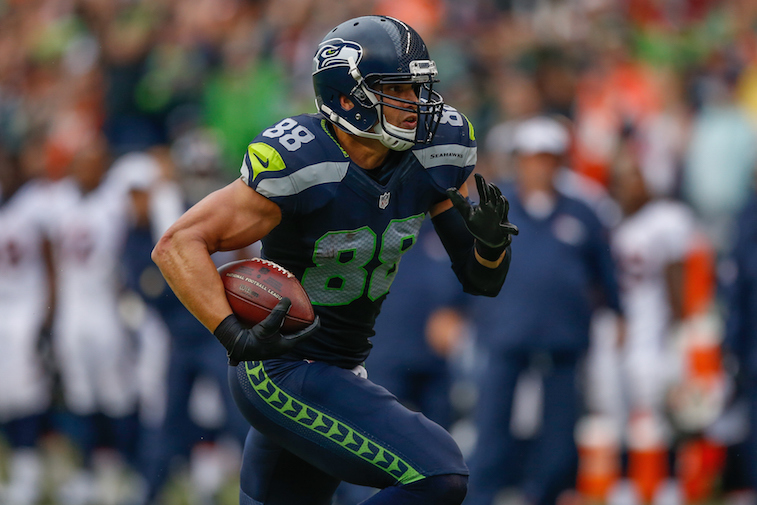 NFL: Will Jimmy Graham Be An Elite Tight End in 2016? Entering his first season with the Seattle Seahawks, many expected tight end Jimmy Graham to be a critical piece to the team’s puzzle after they experienced back-to-back Super Bowl appearances. Stringing together four consecutively productive seasons, Graham had established himself as one of the elite tight ends in the league with the New Orleans Saints. He hauled at least 85 catches, more than 850 receiving yards, and at least nine touchdowns during that time. During this span, he recorded more receptions, receiving yards, and receiving touchdowns than any other tight end in Saints history. On that same note, Graham benefited greatly from being the primary target in a pass-heavy offense with a future Hall of Fame quarterback in Drew Brees. This made it a bit of a surprise move when the Seahawks acquired the three-time Pro Bowler last offseason and, along with a 2015 draft pick, dealt two-time Pro Bowl center Max Unger, who is regarded as one of the top centers in the league. It was a hefty price in exchange for Graham but he’s extremely talented elite player at his position. However, things didn’t necessarily pan out the way that the 29-year-old hoped; he failed to surpass 60 receiving yards in five out of his first six games but he did put together one strong outing with 140 yards on eight receptions against the Carolina Panthers. This lent itself greatly to Graham venting some of his frustration early in the season due to his lack of involvement in the offense. His reduced role in the passing game was expected given that the Seahawks have a run-oriented offensive game plan that centered around Pro Bowler Marshawn Lynch. They had plenty of success using that formula, reaching the playoffs in four out of the first five seasons under head coach Pete Carroll, including a pair of consecutive trips to the Super Bowl. Graham did add a much-needed element to the offense, in particular the red zone, but he struggled to find solid footing in his new role. He only hauled in two touchdowns this season, with zero trips to the end zone in the last eight games. Graham appeared to turn a corner in Week 12 against the Pittsburgh Steelers with one of his best games of the season, making four catches for 75 receiving yards, but his season came to an abrupt end after suffered a season-ending torn right patellar tendon while he attempted to haul in his third touchdown of the year. For Graham, it was a disappointing end to a frustrating first year with the Seahawks, but there’s much to be encouraged by heading into the 2016 season. First and foremost, Graham is on pace to be ready ahead of the season opener in early September. He has been attending the team’s two-week voluntary condition program that began earlier this week. Although there’s no clarity on his level of participation in the program, it’s a huge step in the right direction to rehabilitating his right knee. Aside from his health, Graham can be encouraged by Wilson’s emergence as a legitimate passer, which saw the quarterback put together a historic second half of the season, setting several Seahawks’ single-season records by becoming the first player in franchise history to throw over 4,000 yards and 34 touchdown passes while posting a league-best 110.1 passer rating. Wilson became the first quarterback to throw three-plus touchdown passes and post a 128.3 or higher passer rating in five consecutive games. He threw at least one touchdown pass in each game in 2015, which made him the only quarterback to have 4,000 passing yards, 30-plus touchdown passes, and more than 500 rushing yards in a single season. Looking like an elite quarterback during that span, Wilson became the first player to throw 19 touchdowns with no interceptions over a five-game stretch and the only quarterback in NFL history to throw three-plus touchdown passes over that stretch. What this demonstrated more than anything is that he’s more than capable of carrying the offense, which is a great sign for Graham as he hopes to see a much larger volume of targets in the passing game next season. It was never that Graham didn’t show the ability to be a major factor in the passing game, but rather that he wasn’t given a consistent role that would allow him to showcase that. He’s one of the game’s biggest offensive weapons and an extremely difficult cover for any defender because of his size, speed, and athleticism. There will still be a strong emphasis on getting the ground game going with Thomas Rawls, who is coming off an impressive rookie campaign, but with Wilson becoming a more willing passer, it could lead to a bounce back campaign for Graham. Statistics courtesy of Pro-Football-Reference.com and ESPN.com.